These were the surprising, profound words a wise friend had for me when I called to consult her after having a particularly bad fight with my boyfriend (now husband), Sanjay. I was ready to walk out of the relationship one night when we were at each other's throats. I yelled at him, "You're impossible. I love you, but I can't keep doing this!" I left our Upper West Side apartment shaking with anger and hurt, storming down Broadway until I found a hotel to see if a room was available. I eventually returned home late that night but realized that I had to do something different or our relationship would not survive. I explained our drama to Lorell, a wise friend who provided amazing counsel to me. I shared how conflicted I felt and that’s when she proffered those three magic words. I suddenly realized the mistake I'd been making my entire life. 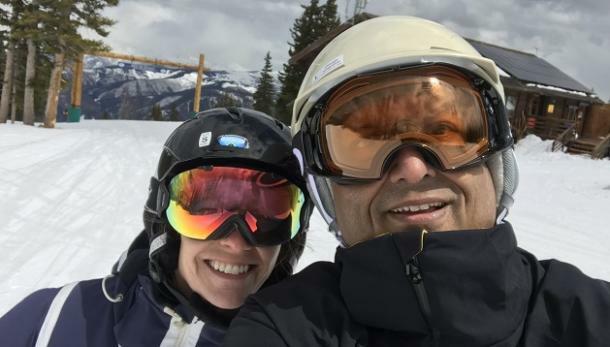 I had been perpetuating the turmoil in our relationship by continuing to focus on Sanjay's shortcomings and the challenges in our relationship. Rather than continuing to blame him — and not acknowledge where I was at fault, I realized I needed to love him as he was and do all that I could to serve the relationship. Rather than sit around fretting and feeling badly about what he did or didn’t do or the conflict that often bubbled up, I also realized that I needed to fully accept myself and not let the fear of rejection or feelings of vulnerability prevent me from being a much better, more open and proactive partner. I have always been a pretty guarded person. My tendency had been to isolate myself emotionally, almost always avoiding conflict as a means of protecting myself. I have also been, like many professional women who are passionate about their career, profoundly guilty of putting my work first. (OK, also second. And sometimes, third.) Sanjay would joke that he was hoping he could move up from the tenth priority on my list. He’d usually say it in a joking manner, but it really wasn’t ever funny. Looking back, I can see why he felt hurt and how that hurt would bubble into anger and criticism, causing the conflict in our relationship to boil over and cause me to retreat and withdraw, only exacerbating the problem. Sanjay and I loved each other deeply. We were truly committed to one another. But, for all of our commitment and love, we continued to run into the same wall of not feeling loved enough by one another. I finally realized that I needed to change. I realized that I needed to take the lead and forge a path forward to build a fulfilling relationship. I realized it would require a profound, new approach — in fact, a radical one. What was that new approach? It's what I have come to call Radical Acceptance. Radical Acceptance is the key to making a relationship not only work but thrive. I believe in the practice so passionately that I even wrote a book about it — Radical Acceptance: The Secret of Happy, Lasting Love. Radical Acceptance means loving someone fully for who he or she really is — flaws, shortcomings, weaknesses, and all. It is loving without judgment. Indeed, it’s going a big step further and replacing judgment with empathy and compassion. To radically accept someone means: I know of your flaws, failures, weaknesses, and shortcomings. I still love you, here and now. I won’t resist or resent these differences and shortcomings. I will try to extend them tenderness and make peace with them. Innumerable studies have shown that people feel better about themselves after they have given a gift. Radical Acceptance is gift-giving on steroids, creating an immense opportunity for the giver to feel better because it truly is the most powerful, valuable gift you can give to someone else — and to yourself. Radical Acceptance opens your heart and mind in truly transformational ways, which is why it is so powerful and healing, both to the person practicing it and the recipient of it. If you commit to it and practice it, it’s a total game-changer. Radical Acceptance is as much about accepting others’ short-comings as your own. We all deserve more kindness and tenderness from ourselves. How often does that endlessly critical loop of doubt, guilt, shame, and criticism run on endless repeat in your head? Those inner voices of judgment have also been damaging and undermining to me. Which is why I emphasize that extending Radical Acceptance to yourself is crucial. Just think for a moment how it would feel if you knew your spouse or significant other fully accepted you — ALL of you? Wouldn't that be the most liberating and empowering feeling imaginable? In my observations, only a lucky few have achieved such a status — but it is my belief that almost everyone can. I say almost everyone because Radical Acceptance requires a considerable amount of work, fortitude, and emotional resilience, but it is worth every ounce of effort you’re willing to make — both for that other person and for yourself. In addition to my own experiences, challenges, and eventual triumphs, I came to the concept of Radical Acceptance over time-based on carefully observing and advising on others' relationships and by connecting the dots between the research my media company, YourTango, has conducted on love, along with many powerful insights from innumerable thought leaders in the fields of mental health, brain science, neurobiology, psychotherapy, and relationship counseling. For so much of my life, I had been observing how so many people I knew and were close to struggled in their relationships, how frequently even kind and caring people let their egos, their judgments, their hurts and counter-productive narratives get the best of them — often with very hurtful, damaging consequences, including, sometimes, divorce and infidelity. And not just in romantic relationships! I see dynamics such as these all the time — among parents and children, siblings, friends, colleagues and others who care about one another but get bent up like pretzels, unable to work through so many common relationship issues. Over a number of years, I had unwittingly developed a crucible in which various sources of inspiration, along with plenty of heartache and soul searching in my own and in the observations of others’ lives, ultimately crystallized into the concept of Radical Acceptance. As time went on, I developed a powerful formula with five distinct steps that I detail below. The results? Radical Acceptance has had a transformative impact on innumerable relationships — with others and with oneself. I have had many parents tell me how powerful it has been to improve and heal relationships with their children. Radical Acceptance truly is a practice, starting with the active compassionate acceptance of yourself — flaws, shortcomings, weaknesses and all. You commit to loving your partner (or child, parent, friend, etc) fully — right here, right now, ignoring the itch to fix, control, improve, or judge them. You make every effort to exercise emotional restraint when it’s called for and to look within and be radically honest with yourself in terms of where you may are contributing negatively to the problems in your relationship. You go the extra mile to communicate that you truly do love ALL of him — including the parts that appear scary, foreign, difficult, weird or hard to love. You prioritize your partner, you prioritize your relationship. I always say love is an action word because it’s ongoing, endless deliberate actions and conscious efforts that energize and build lasting love. You dedicate yourself to the practice of Radical Acceptance and keep doing it, again and again and again. YES! A big amen to that. Rather than letting Sanjay push my buttons and getting upset at the things that disappointed me, made me feel angry, and caused me to fight back, I decided that I would accept the parts of him that upset me and simply love him — all of him. If I am being brutally honest, I typically blamed him for the conflict, not realizing how toxic and damaging blame was and not realizing how I was contributing to our problems, causing him to feel hurt and unloved. I committed to doing a much better job of taking responsibility for where I was at fault, whether it was because of my behavior (or more like the lack of loving behavior far too often) or because I had a tough time managing the challenges in our relationship in a mature, constructive manner. I confess that this was hard. And sometimes it can still challenge me. But I am committed to the practice of Radical Acceptance because I can say (shout! sing!) unequivocally: IT WORKS. It’s not a quick fix — far from it. It takes wisdom, maturity, patience, emotional resilience, a willingness to let go of your ego, and the need to be right. And most of all, it takes a lot of work. It truly is a practice. I have discovered that Radical Acceptance is the most important, meaningful work of my life which is why I am super excited to share it with you. Please also note that this for everyone who wants to achieve happy, lasting love — to feel more confident and compassionate, to be more connected to friends and family. While I principally write in a conversational “hetero-girlfriend-to-girlfriend” tone to make my writing as natural and personal as possible, I hope my message will appeal to you regardless of your gender or sexual orientation (as well as your age, race, culture, or religion). Now, you may be thinking: Isn't Radical Acceptance just another way of settling? 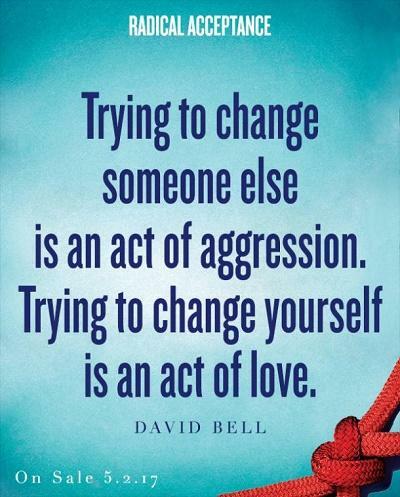 Or passively allowing someone to be a jerk or abusive or self-destructive? Emphatically: NO, it is not. 1. Radical Acceptance makes you stronger. It is fundamentally empowering. It is a bold, powerful choice because it is fundamentally choosing love. It is not rolling over nor taking the path of least resistance. It is not resigning yourself to subsisting on crumbs nor being a doormat. Frankly, it's a lot easier to fight and stay stuck in old crappy patterns than to exhibit the strength and perseverance required of Radical Acceptance. 2. Radical Acceptance works when it comes to what can generally be characterized as personality shortcomings, quirks, bad habits, and differing styles and preferences — NOT acute character flaws and never when any form of abuse is involved. It is crucial to recognize the difference between the two in your partner. He talks too loudly, he doesn't clean up after himself, he spends excessive time watching TV... on and on and on. Assuming none of these are present in the extreme, they are not necessarily character flaws. They may be frustrating and annoying as hell, but if he is ethical, trustworthy, moral and kind — in other words if he’s a good guy — he warrants Radical Acceptance. But, if he is truly a jerk, abusive, overly narcissistic, has substance abuse issues, or anything along those lines, Radical Acceptance is not the answer. If there’s mental, physical, or emotional abuse of any kind, get out of the relationship, full stop. STEP 1: Just Love Him (or Just Dump Him). You will identify his unlovable parts, and then you will commit to just loving him, no matter what. If you can’t commit to loving him, then it’s time to move on. Without this crucial, binary step, Radical Acceptance cannot happen. STEP 2: Stop, Reflect, Introspect. You will explore what happens when you inevitably want to reject something, maybe several things, about him. You will want to make him stop doing that extremely annoying thing he does. Perhaps you’ll mutter “Oh my God! I’m going to kill him” under your breath. That’s okay — who hasn’t felt these excruciating pangs of anger and hurt? Stop, Reflect, Introspect is a powerful technique that allows you to get outside your emotional reactions. Not only will this help prevent blowups, but you will also understand what occurs internally for you that enables so much pain and hurt. Learning about the impact of body language and how a powerful bio-feedback exists within each of us is makes this step very actionable. Empathy and compassion also play a leading role here! STEP 3: Radical Communication. This involves a number of proven methods for creating safety in your relationship. Safety and trust are essential ingredients for successful communication. Creating a safe space for vulnerability is crucial for Radical Acceptance to fully take root — as is learning what sabotages safety and productive communication. STEP 4: Love All of Him—Even the “Unlovable” Parts. There is no such thing as meeting him halfway when it comes to Radical Acceptance. Radical Acceptance means you always have his back — even when he is wrong. Radical Acceptance is unconditional love — when it feels unbearably difficult when you feel deeply hurt or disappointed, or even when you feel he is at fault. STEP 5: Apply the Platinum Rule and Make Him Your Priority. Yup, we’re going one past the golden rule! In this step, I urge you to practice how to express your affection in ways that are most meaningful to him, and how to train yourself to become more in tune with his wants and needs without becoming a feminist’s nightmare! I also emphasize how crucial it is to make sure he’s a priority to you — and that he knows it. Prioritizing him and prioritizing your relationship are key to Radical Acceptance working and key to achieving happy, lasting love. If you want to feel truly valued and actively cared for, do the same for him. I always say “love starts with you!” So often we wait for someone else to make us feel loved and cherished. We get cranky when they don’t meet those, often never-verbalized, expectations and a vicious cycle starts. Step 5 is all about starting a virtuous cycle, where love and abundance beget love and abundance. In the long run, Radical Acceptance has given me a sense of profound grace. It has truly been transformative in mine and Sanjay’s marriage. It's helped Sanjay understand me better so that he can more fully accept me. It's enabled me to be much more compassionate with him, offering more understanding, tenderness, and empathy. Radical Acceptance has liberated me of so many dark thoughts, toxic judgments, and petty grievances. It has soothed an isolated heart aching to feel loved. It has brought the VERY BEST out of my husband. Not by insisting he change, mind you, but by taking the high road, by opening my heart and mind day after day and stretching myself to give him the love he deserves. We both feel so much more loved and understood by one another thanks to our practice of Radical Acceptance. That is why I am bursting with excitement to share my insights with you. Now that you've read this, I ask you to consider allowing Radical Acceptance into your life. Let's help each other along this journey — and it is a journey! The time for Radical Acceptance has never been better: what the world needs now is for each of us to be less judgmental and reactive and, instead, more empathetic and better able to open our hearts and minds to one another. I am relentlessly committed to planting Radical Acceptance into the hearts and homes of people across the globe, spawning an army of happy, loving “Radical Acceptors.” I am ready to launch a beautiful, powerful Radical Acceptance movement. Please join me! 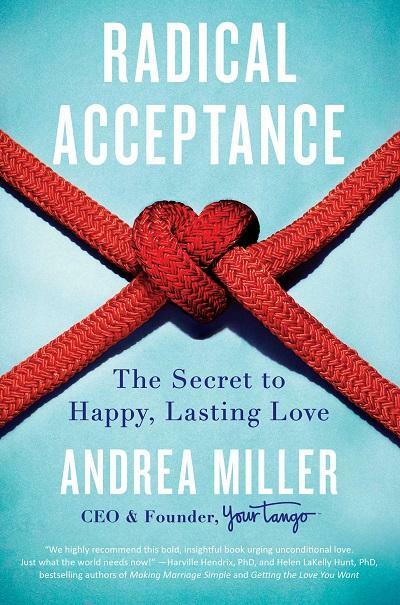 “Radical Acceptance: The Secret to Happy, Lasting Love” is now available for pre-order. 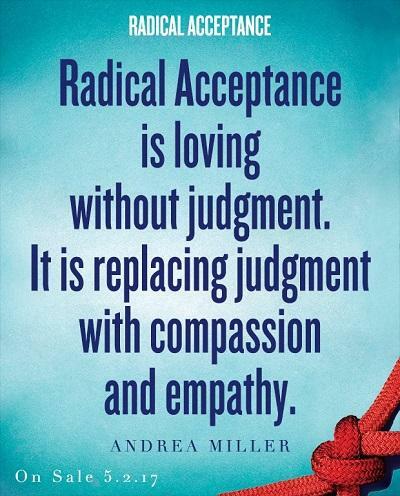 Please share your Radical Acceptance stories with us on the Radical Acceptance Facebook page!